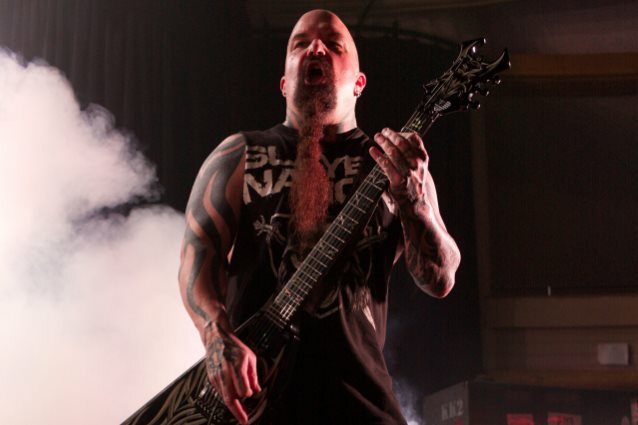 In a brand new interview with Revolver magazine, SLAYER guitarist Kerry King was asked if there are any plans in place for the band to begin working on a follow-up to 2015's "Repentless" album. He responded: "Funny thing is, 'Repentless' isn't even two years old yet, though it seems like it is. But from that session, there are six or eight songs that are recorded — some with vocals, some with leads, but all with keeper guitar, drums and bass. So when those songs get finished lyrically, if the lyrics don't change the songs, they'll be ready to be on the next record. So we already have more than half a record complete, if those songs make it." He continued: "This is actually the most prepared we've ever been for the next record in our history; there's no reason to not do more work, because it's already more than halfway done. Just write four or five new songs, and give the others some attention, and we'll be good to go. If we get a down period of time, which I know is coming at the end of this year, maybe we'll focus on that and get to it." Pressed about whether it's "conceivable" that we could see a new SLAYER record next year, Kerry said: "It's conceivable — but I'm certainly not gonna promise it, because every time I do, I make a liar of myself! [Laughs]"
"Repentless" was released on September 11, 2015 via Nuclear Blast. The follow-up to 2009's critically acclaimed, Grammy-nominated "World Painted Blood" was produced by Terry Date, who has previously worked with PANTERA, DEFTONES and SOUNDGARDEN. The artwork was created by Brazilian artist Marcelo Vasco in collaboration with Tom Araya and Kerry King. SLAYER's six-week North American tour with LAMB OF GOD and BEHEMOTH will kick off on July 12 in Bemidji, Minnesota and run through August 20 in Phoenix, Arizona. SLAYER and LAMB OF GOD will also play Wisconsin's Rock Fest (July 13) and Rock USA 2017 (July 15), and then meet up with BEHEMOTH at the Chicago Open Air festival on July 16.